Bee Venom - Poison or Medicine? Bee venom, also known as apitoxin, is a colorless, poisonous liquid that bees sting you with. It is made up of complex mixtures of enzymes and polysaccharides and comprises more than eighteen biological active substances that cannot be replaced by any synthetic substitutes. Bee stings are poisonous, painful and produce inflammation. The bee venom from the sting contains a mixture of histamine that induces allergic reactions, and dopamine, which raises heart rate. 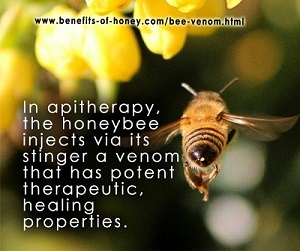 Hence, bee venom therapy and injection may not be suitable for every patient. For people with insect sting allergy, bee venom may trigger serious or life-threatening allergic reactions. Studies have proven that bee venom has pain reduction and anti-inflammatory effects and is used as a traditional folk medicine in many cultures to treat a myriad of diseases including arthritis, cancer (General Physiology and Biophysics, Jun 27, 2016), muscle injury, insomnia, neuropathy, migraines, depression, multiple sclerosis, Parkinson's disease, paralysis, rheumatism (Bee Culture, June 26, 2017), etc. In ancient Chinese culture, this cure is known as "fighting poison with poison". It is believed that bee venom is a powerful catalyst for the various physiological processes in the human body. For instance, in bee venom therapy, when the stung skin becomes inflamed and swollen, it goes into a repair and healing mode, producing collagen, the substance that is known to make skin glow and look young and smooth. The idea of applying bee's poison onto the face as a beauty formula sounds counter-intuitive, bizarre or even scary, but today, bee venom is proven to be a safe drug ingredient for cosmetic topical uses and has become a popular ingredient in skincare products such as anti-aging skin lotions, creams and serums (Journal of Cosmetic Dermatology, May 2017). Dubbed as a natural Botox, bee venom can help stimulate cell restoration, increase blood circulation, trigger the skin to produce natural collagen, fight facial lines and promote skin firmness. In fact, it has been reported that many royal and celebrities, such as Kate Middleton and Gwyneth Paltrow, use apitherapy and bee venom-infused skincare products as part of their beauty regimen. A clinical study (Clinical Interventions in Aging, 2015) involving 22 South Korean women who applied a bee venom treatment serum on their face twice daily for three months showed that bee venom serum reduced fine wrinkles, made skin look healthier and more youthful, and improved skin smoothness, softness and moisture. 1. Concoct your own favourite beauty treats at home using honey. More in: Anti Aging Skin Care Tips with Honey. 2. Simple DIY face mask recipes that have become very popular among honey enthusiasts. Check out Easy Face Mask Recipes for Different Skin Types. 3. Three aromatic honey face masks that will surprise you with wonderful results for your skin! 3 Fragrant Honey Face Masks. End of "Bee Venom - Poison or Medicine?". Back to "Common Terms of the Honey Bees World"